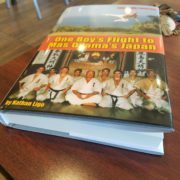 Nathan Ligo : Author, Nonprofit Director, Instructor of Kyokushin Karate. Nathan Ligo is seen here (ight) with Triangle Comunity Foundation Director Andrea Bazan, and Chairman Phail Wynn, recieving that foundation’s 2011 What Matters Innovation Award. Nathan Ligo, shown here receiving Triangle Community Foundation’s 2011 What Matters Innovation Award for Nonprofit Excellence, is an author, a karate instructor for Kancho Hatsuo Royama’s Kyokushin-kan International Karate Organization in Japan, and the founder and director of a nonprofit organization in Durham, NC working with at-risk youth. Nathan is a graduate of the nationally-ranked Davidson College, in Davidson, NC, and the only American, and one of only three non-Japanese, to hold a graduation certificate from Mas Oyama’s legendary Young Lion’s Dormitory program in Japan. This award was presented by Mas Oyama in 1991 in recognition for Nathan’s enduring nearly 600 days in a 1000 day program that had never, at the time he begun, been completed by a Westerner. Nathan Ligo founded this nonprofit organization in 1999, Society for the Betterment of the Human Condition through the Training, Instruction, and Propagation of Budo Karate, d.b.a. Ligo Dojo of Budo Karate, and Ligo Ink. Nathan Ligo’s online content as well as dojo updates and instructional material can be found on the Budo Karate West blog.